The FARC rebels in Colombia said they had captured a former soldier from the United States and were willing to let him go to prove their commitment to the ongoing peace process. The rebels released a prepared statement that said they had captured Kevin Scott Sutay. The statement said Sutay had been captured June 20 in the town of El Retorno in Guaviare Department in southern Colombia. Thus far, no one in the U.S. government has commented on FARC’s claims. Talks for reaching peace between the Colombian government and the guerrillas opened in Havana last November. This marks the fourth time an attempt has been made to reach a peace deal since the armed conflict started during the 1960s. FARC said that Sutay told them he worked for the U.S. Navy as an explosives and anti-mining specialist until this past March and served from 2010 to 2011 in Afghanistan. The rebel group said his passport said he was a native of New York and that he had traveled in Mexico, Costa Rica, Honduras, Panama and Nicaragua before in arrived on June 8 in Colombia. The statement by the FARC said if the American was to be released the group would need a humanitarian mission that included Piedad Cordoba, a former senator and the Red Cross International Committee. The statement added that even though the law allows them to keep Sutay as a POW, the group has decided to free him to help with the spirit of the peace process going on in Havana. 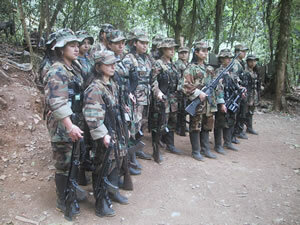 It is thought that the FARC now only have 8,000 members down from the 16,000 they had in 2001. The Colombian government estimates that more than 600,000 have died since the conflict started with another 3 million displaced internally from the fighting.